Amazon has unveiled a new online store dedicated to wearable technology, making it easier for customers to discover and learn about such devices. Dubbed Amazon Wearable Technology, the store features wearable devices like smart watches, fitness trackers, healthcare devices, cameras, and more. “Wearable technology is an exciting category with rapid innovation and our customers are increasingly coming to Amazon to shop and learn about these devices,” John Nemeth, Amazon’s director of wireless and mobile electronics, said in a statement. The store includes Learning Center and Video Library sections that contain information aimed to help shoppers compare gadgets. There is also an Editor's Corner with the latest news about wearable devices. 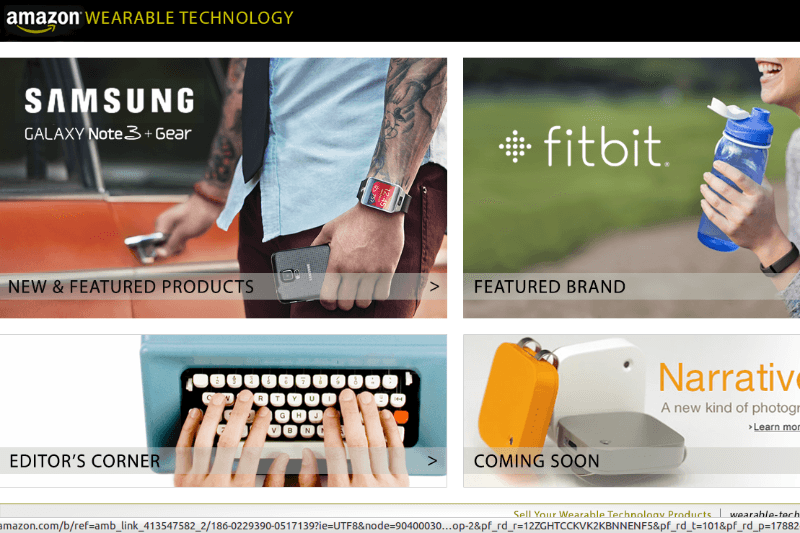 Among the brands included in the new store are Samsung, Jawbone, Pebble, GoPro, Fitbit, and several others. The launch comes just a few days after the company revealed its 2014 first quarter earnings. Although wearable technology has been there for more than a decade now, the category has only recently started to receive mainstream attention. Several tech giants including Google, Apple, Samsung, and more, are actively developing devices based on the concept. Samsung recently released two smart watches and an activity tracker, and Apple is said to be developing its own "iWatch". Meanwhile, Glass, Google's smart glasses, is also nearing a planned consumer release later this year. The Mountain View, California-based company recently held a one-day promotion sale of its wearable computing device, making it available to anyone who wanted to purchase it. The company is also developing software for smart watches and has patented technology for smart contact lenses.